A project to turn farmers' fields in Cornwall into a salt marsh has been officially opened. Environmental organisations have spent the past seven years creating a habitat for wading birds and otters. About 15 acres of meadows at Treraven, east of Wadebridge, are reverting to marshland, with sea water being allowed to flood farmland during high tides. Wildlife is already benefiting from the efforts of the Environment Agency, Natural England and local landowners. The salt marshes will produce good habitats for birds and become increasingly colonised by plants like the sea spurry. Wading birds have already started to gather in the area, which was first flooded in January. James Burkes from the Environment Agency said it should also benefit otters who use the River Camel. He told BBC News: "We're hoping to encourage them to forage around in the new meadows and creeks, looking for eels and other foods." 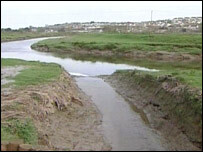 Visitors to the nearby Camel Trail can see the effects of the twice monthly floods. 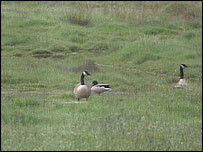 It is one of the largest habitat restoration schemes in Cornwall and is the size of about 45 football pitches. The 500,000 people who use the Camel Trail every year should be able to enjoy the new salt marsh meadows, although some access for the public will be reduced. But many local people have said the change is an acceptable trade off. "Viewing it from a distance is the key feature here," said Vaughan Warren, who walks in the area.